Typically, you know a hurricane is coming. You can track its progress and growth as it moves west through the Atlantic and Caribbean. But, that doesn't make a hurricane any less devastating. Nothing you can do will mitigate the strength of a storm, but there is plenty you can do before it hits to get ready for the after-effects. For those living in hurricane-prone areas, you know exactly how long a power outage can last in the wake of a storm. With this in mind, it's advantageous to stock up on necessities before the storm hits. Once the storm has done its damage and estimates are given as to how long it will take to restore power, that's when the shelves of stores really go bare. Don't wait, plan ahead. You'll want to stock up on the following items. Beyond supplies, it's important to be aware of your surroundings. Are you in an evacuation zone? Do you have an evacuation plan? Do you live in a flood plane? These are all important questions to ask before the storm hits. Having a plan and knowing what to expect will help you stay calm and keep you and your family safe. If you're lucky enough to already own a generator or can get your hands on one, there are a few things to keep in mind. They require gas, oil, and power cords to generate and provide electricity for your refrigerator, lights, sump pumps, and more. 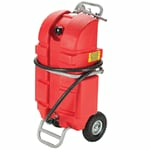 Just be absolutely sure never to run a portable generator inside your home, garage, or near open windows or doors. The exhaust given off by a gas-powered generator contains carbon monoxide and can be deadly. It’s important to know how to run a generator safely. 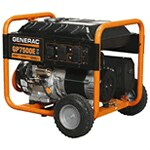 Once your generator is running, it’s generating electricity. However, you’ll need generator power cords to transfer that electricity to the appliances you wish to power. Make sure you choose power cords that match the wattage of your generator. 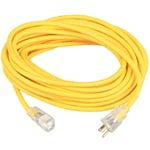 Each cord will list its maximum watts, and it’s better to oversize the cord than to undersize it. Also make sure that the length of your generator power cords are sufficient for reaching your appliances from the generator outside, as it’s not recommended that you connect multiple power cords in a single strand. First-off, it’s important to note that you should have a stockpile of at least 25-30 gallons of gasoline on-hand in case of an extended power outage. If you run out, you’ll be fighting long lines at the local gas stations, and that’s assuming that the pumps haven’t already run out of gas. It’s recommended that you have a 5-gallon can of gasoline for refueling and a larger 25-gallon fuel tank for reserves. If you’re facing a post-hurricane power outage, you may be providing your own power for an extended period of time. 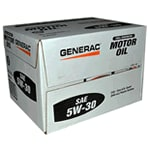 When you’re running your generator for that long, you’ll have to perform oil changes to keep the engine in peak running condition. With roads closed and everyone relying on backup power, you may have a hard time running out to get a quart of oil, so grab it when you get your generator. Electric Generators Direct offers helpful advice and tips for preparing for an impending hurricane. By loading up on supplies before the storm hits, you can be more comfortable in the blackout aftermath.